Just like their pet parents, a dog's body is unable to make omega-3s and they need a food source that provides them with these essential fatty acids. Increasingly, studies are finding that omega-3s do not only have nutrients that can improve the health of pets, but can also prevent various diseases and infections, thus prolonging the life of pets. Offering omega-3s in pet food can be seen a competitive advantage for pet brands, as pet's can highly benefit from these essential fatty acids. The National Research Council (NRC) recommends a ratio of 2.6:1 to 26:1 omega-6 to omega-3 for pets. Many dog diets are very rich in omega-6s, and thus it is important for pet owners to know the required omega-3 levels for their dogs, as well as the source that might be already included in their pet food. A description of the ratio of omega-6s to omega-3s on pet food packaging can help pet parents make the right choices for their pets and decide whether additional omega-3 supplementation may be required. Prolonging the life of your pet means preventing certain heart problems. Omega-3s can help achieve this by maintaining healthy blood pressure and decreasing triglyceride and blood cholesterol levels. Studies have shown that regular and sufficient consumption of the omega-3 fatty acids EPA and DHA are essential for pets to maintain a healthy and well-functioning heart, therefore, reducing the risk of cardiovascular disease. Omega-3s have anti-inflammatory properties, which support joint and muscle health. Especially active dogs need a sufficient and regular intake of omega-3s to strengthen their muscles and joints, and to recover faster from heavy exercise. There’s no denying that dogs are curious souls who are constantly exposed to germs and bacteria around them, which makes them vulnerable to diseases. Omega-3s can help to strengthen their immune system, so that they can continue to satisfy their curiosity. Allergies and other infections can weaken the body and lead to an overactive immune system that can be extremely harmful to your pets’ health. Omega-3s may help prevent and fight against such reactions. It can also slow the growth of common yeast infections in dogs and cats. When considering the amount of health benefits that omega-3s offer to pets, more pet food products should include at least a minimum level of omega-3s in their recipe. Omega-3s can be obtained from different sources, however the most beneficial for pets remain to be omega-3 fatty acids, such as EPA (eicosapentaenoic acid) and DHA (docosahexaenoic acid), mainly sourced from marine ingredients. 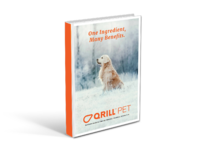 Read more about the benefits of Antarctic krill for pet food here.